The newly refurbished State Dining Room provides an elegant setting for the formal entertaining of guests and foreign dignitaries. The famous George P.A. Healy portrait of Abraham Lincoln hangs above the marble mantel of the fireplace. Trees trimmed with the festive ingredients of a season rich in tradition - gold holly, cinnamon sticks, pine cones and crystallized fruits - accent the room. 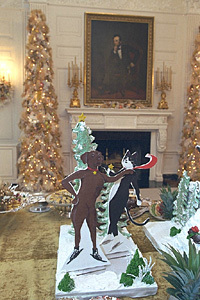 Each holiday season the State Dining Room showcases the traditional gingerbread creation by the White House Pastry Chefs. This year, Mrs. Clinton invited the chefs to capture the fantasy of Winter Wonderland on a grand scale. The State Dining Room table has been transformed into a magnificent, edible kingdom. 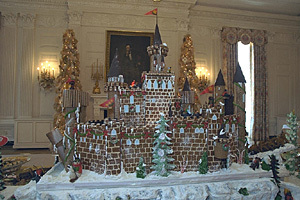 A mountainous forest surrounds the gingerbread castle and its towers and bridges. Miniature versions of Socks and Buddy frolic throughout the kingdom in the true spirit of the holidays.